Capricornus Constellation the Sea Goat, is an ecliptic constellation laying between constellation Sagittarius and constellation Aquarius. It spans 25 degrees longitude in the zodiac sign Aquarius. 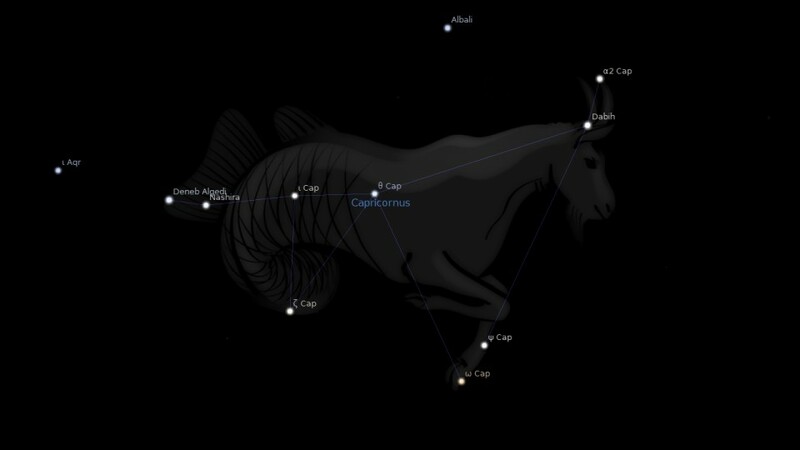 The Capricorn constellation contains 17 named fixed stars. In astrology, with Taurus and Virgo, it was the Earthly Trigon, and black, russet, or a swarthy brown, was the color assigned to it; while, with Aquarius, it was the House of Saturn, as that planet was created in this constellation, and whenever here had great influence over human affairs; as Alchabitus asserted, in the Ysagogicus of 1485, caput et pedes habet; and it always governed the thighs and knees. It also was regarded as under the care of the goddess Vesta, and hence Vestae Sidus. Ampelius singularly associated it with the burning south wind Auster, and Manilius said that it reigned over France, Germany, and Spain; in later times it ruled Greece, India, Macedonia, and Thrace, Brandenburg and Mecklenburg, Saxony and Wilna, Mexico and Oxford. Manilius also wrote of it as in our motto, And at Caesar’s Birth Serene he shone. Giedi is the first star by longitude in Capricorn, also the first by Greek letter rating, α Capricorni, though not actually the brightest. It should be pronounced ‘zhaydy’, coming from one of the Arabic words for goat: Al Jadii. Situated in the head of the creature, it is actually a stellium of five stars in two very close groups, α¹ and α². The first contains three stars, the second two. 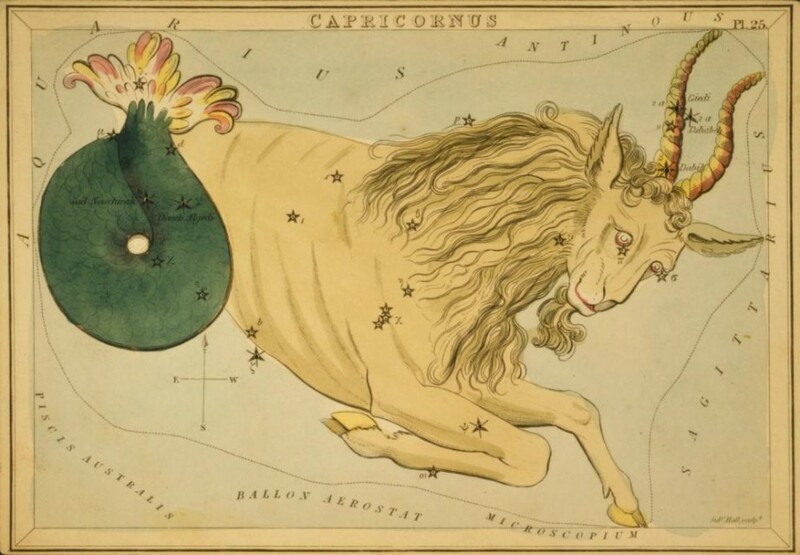 Very close to these is γ Capricorni, Al Shat (the Sheep), generally viewed as a ‘sacrificial lamb’ symbol, while conjunct in longitude but somewhat to the south of the others is β Capricorni, Dabih, ‘The Slaughterer’. This is another apparent double star, β¹ and β². It will serve us best to consider the whole group at once. Ptolemy gave Giedi the very unusual rating of a Venus-Mars type, while Dabih, its full name being Al Sa’ad al Dhabih, the Lucky Slaughterer, is a Saturn-Venus. He did not mention Al Shat, which seems to have been introduced into the scene by Arab astronomers, for the attention of Mr. Dabih, we must presume. 1. Fixed Stars and Constellations in Astrology, Vivian E. Robson, 1923, p.36. 2. Fixed Stars and Judicial Astrology, George Noonan, 1990, p.36. 3. Star Names: Their Lore and Meaning, Richard H. Allen, 1889, p.135. 4. Astronomica, Manilius, 1st century AD, book 4, p.241. 5. The Living Stars, Dr. Eric Morse, 1988, p.100.